[NEW] Orange "Bright Box" router hacking :-) - Page 5 - The Scream! I think unlokia has solved this for you but I'll just add this.. The Bright box runs embeded linux so may read ext / ext2 / ext3 natively although I have not tried this, some apple OSs' also read this natively also I belive although I could be wrong As I've only ever used a Mac once. To mount HFS+ though I would imagine that would most certainly mean reverse engineering the firmware which is not something I could do. If you use the above hidden admin links and enable manufacturer mode then the brightbox will give you root telnet and you should be able to mount ext partitions if it does not automatically. Please make sure you have a backup if you try this as I have not tried it. Nice piece of hardware, I'm not into smartphones yet. I was looking at the Bt vision box (the black one) but from what I've seen they are winCE based and the serial access is all locked off at the CPU, Anybody have any sugestion for router or embeded linux based hardware they want hacking? Yes you will need a telnet client and a PC you can connect to the bright box over ethernet and set the IP address of manually. Hi Whitenight, thanks for helping out. The issue is not so much with the format of the drive (as I'm happy to work with FAT32/NTFS even though HFS+ would be useful). The issue is that the Brightbox doesn't seem to recognise a partition of a drive if it is on a harddrive where other partitions also exist. i.e. the Brightbox only seems to work with external drives that have only a single partition (of a valid format). Do you think this is something that could modified through the root telnet? Forgive me if I've not understood anything from your post - I'm a networking novice. That's Strange, I am able to easily have 2 types of partition on one USB drive show up on the BB and they show up as a network shared folder. It could be the size of the partition maybe? tell me again the size and filesystem of each partition on your drive? also this might sound stupid but looking at it but is it extrnally powered as i doubt the BB will have enough juice coming thru the usb to power that peice of art. Also when creating my partitions both are setup as primary partitions. It could be that Basil has a "GUID" partition scheme on his drive (the default for Intel Macs/Mac drives) whereas a PC/Linux user would generally have a partition scheme of the type "MBR" (Master Boot Record). One question - when you partitioned and formatted the large drive you wish to use, did you use "Disk Utility" in Mac OS X to do so? If so, I think it defaults to "GUID" partition type, whereas Windows/Linux disks on x86 PC hardware use "MBR" (Master Boot Record) partition types as default, which could be where the issue is here. I would not expect a layman to know the difference between these, so this situation you have could well be caused by that being the case. I then plugged this drive into Bright Box, and only the FAT32 and NTFS partitions were mounted and became shared on the network, with R/W access. The EXT3 is unavailable. Based upon this, I cannot see that "GUID" partition schemes are the problem. I am at a loss, for now. I doubt that a *Desktop* external drive is being bus powered over USB; I'm certain that this is likely to be a mains adaptor powered drive. Your problem *could* be in the USB controller chipset used by the Lacie drive - there could be some incompatibility between it and the hardware/firmware used in Bright Box. I'll investigate further. Last edited by unlokia; 19-April-2013 at 22:37. So i put FAT32, NTFS, HFS+ and ext4 partition on one drive and it again only mounted the NTFS and FAT32 partition although going into telnet and rooting around the other partitions do show up but are not mounted and does not look like those filesystems are recognised, which is what I expected. drwxr-xr-x    6 root     root            0 .
drwxrwxr-x    7 root     root            0 .. In theory, the maximum NTFS volume size is 2 32 clusters. However, even if there were hardware available to supply a logical volume of that capacity, there are other limitations to the maximum size of a volume. One of these limitations is partition tables. By industry standards, partition tables are limited to 2 32 sectors. Sector size, another limitation, is a function of hardware and industry standards, and is typically 512 bytes. While sector sizes might increase in the future, the current size puts a limit on a single volume of 2 terabytes (2 32 * 512 bytes, or 2 41 bytes). For now, 2 terabytes should be considered the practical limit for both physical and logical volumes using NTFS. This is why I asked for the size of your partitions, maybe you could experiment by booting gparted and putting 2 extra, small partitions on the disk and see what the brightbox does. Guys, this is looking more promising. Thanks so much for your continued efforts. The partitions were 1.8TB (FAT32) and 2.2TB (HFS+) and it is mains powered. I've just also created a third partition (FAT) at 200GB (reducing the HFS+ to 2TB). It also appears to be GUID (see bottom right of 1st screengrab). After reconnecting the drive to the BB and a restart of everything, 10 mins later OSX recognised the BB in Finder (as it did before), but after another 10 mins it still can't connect (see 2nd screengrab - just get spinning at bottom right). I have to head out but will check back when I return! I did try and check the firmware version, but Lacie's firmware updater didn't even recognise the drive. The drive was only just released, which could be why. Additional boring detail: I didn't use DiskUtility to partition it originally as the Lacie installer has some thing that allegedly only allows the 'eco-mode' to work if you install their 'disk manager' software (which I've yet to figure out). I did have a little experience with the Master Boot Record business as I set up another drive as MBR (from memory) in order to have an NTFS and HFS+ on the same drive (allowing me to backup my Windows 'Bootcamp' partition on the same drive as I backup my OSX). Hi Basil I hope you're enjoying/you've enjoyed the gorgeous weather?! Last edited by unlokia; 20-April-2013 at 17:01. Just a point of note, and pardon me for asking an obvious question... but you have *enabled* the drive to be shared, in the settings, haven't you? I got another Mac (Mac2) and wirelessly enabled file sharing from Mac1. Mac2 could only access (read+write) the HFS+ partition through filesharing, not the FAT/FAT32 partitions. Where would I check/enable the share settings? Update on the connection from my last post - 3 or 4 hours later and it was still the spinning and still saying 'connecting'. The drive was active and I could hear it whir during this though. Sorry this hasn't been straight forward, and I realise that this kind of troubleshooting isn't really the purpose of this thread - so apologies for that, and many thanks for your support guys. I've just re-read your post. Yup, sharing is enabled on the router. Small stick drives work no problems. I'm happy for only the FAT32 partition to be shared, but I'm failing! When you say you "enabled file sharing from Mac1" - would you post screenshots, and explain a little further, since there are myriad ways files can be shared using Macs. In the 'Sharing' settings of Mac1, I enable filesharing (see attached). On Mac2 I connect using the admin credentials of Mac1. This gives me full access to the files on Mac1 from Mac2. I couldn't see the FAT or FAT32 partitions - only the HFS+ one (which allowed me to write to it also). This is what I thought you'd done. What you have done is enabled the files on the Mac to be shared to other people on the same network as that to which the Mac is connected, but this has no bearing on your ability/inability to view the shared drive plugged into Bright Box. You've basically carried out the same procedure for the Mac, as is done on the Bright Box when you enable "USB File Sharing" - you're sharing a drive connected to the device upon which you are making these sharing changes - it ONLY affects that device (in this example, your Mac). I hope this clarifies what you're doing, and where to go next? The reason I tested the filesharing from mac to mac was because I thought I may have it limited on the hard drive itself. And then I realised you were referring to the router (where it is enabled already). I am encouraged that you and whitenight seem to have got multiple partitions viewable through the Brightbox. But in all honesty, I have no idea where to go next! As a matter of proving, you could try removing the HFS+ Mac OS X partition, and try having only FAT32 and NTFS parts, and see if that helps - just as a process of elimination. I enjoy helping you I love a challenge! Gosh... I can give it a go for testing, but I'll need an HFS+ on this drive in future. To be honest, given all these issues, I'm beginning to think I should let go of the hard drive backup thoughts and just trust the cloud as a solution. This is so painful... and even if I do manage it, I'm then gonna need to thing of protecting my external drives somehow. If only this was all more simple.... anyway, I'll try what you suggested tomorrow and see what happens. Thanks Matt, I'm sure I echo the thoughts of many in the appreciation I have of the efforts of people like yourself and whitnight who are out there with the interest and patience to try and help folk like me. Many thanks. So have you been able to view your multiple partitions on the brightbox through the webUI? So if your getting the partitions show up in the BB webUI but you cannot browse them from your Mac then it narrows it down to a networking issue. I'll look into it when I'm back from the Mrs'. The EE should have the same WWW folder, I can't remember off the top of my head but Have you had a root around the bin directory? the BB makes use of symlinks quite alot in the filessystem, I will post the path for you when i get back home. Hi white night, nope I've not seen any partitions from this drive on the network yet unfortunately. Also nothing on web UI. Frustrating... it seems like it should be working given your experience. Don't give up, we'll get to the bottom of it soon, I'm not at home yet but I just wonder if unlockia is running the manufacturer mode firmware as I am, and if this mounts all readable / acessable filesystems by default, maybe the stock firmware dosn't? or only mounts one share at a time? I'll do some more looking into your issue when im home, And post the easy how to guide on how to unlock the BB for other ISPs. The boot code is a different, higher version on the "EE" branded box, which came in the post last week. Last edited by unlokia; 22-April-2013 at 03:35. The script you are looking at will be atmpvc.htm?t=some-random-number. Put whatever username you need for your isp between the inverted commas and press return. You will know that it has executed when the firebug pane echos your command. I performed all this on an Orange Brightbox and it worked fine. I attached it to my DSL line and everything was good BUT I could not log in to the router. I did not worry about this at that point. I assumed maybe it would need to be disconnected from the DSL because it was using a disallowed ISP username, so I decided to look at it later when I had a bit of time. I was able to log in to the router a couple of days later and found that the router had uprgaded itself to the EE firmware so that is probably why I could not log in at first. So I wonder whether the router locks itself when autoupdating. I'm glad that I didn't disconnect it and try to sort it immediately!! I'm very happy as I have now have a decent router running and I can put this Homehub rubbish in the back of the cupboard for emergency use only. Yay! 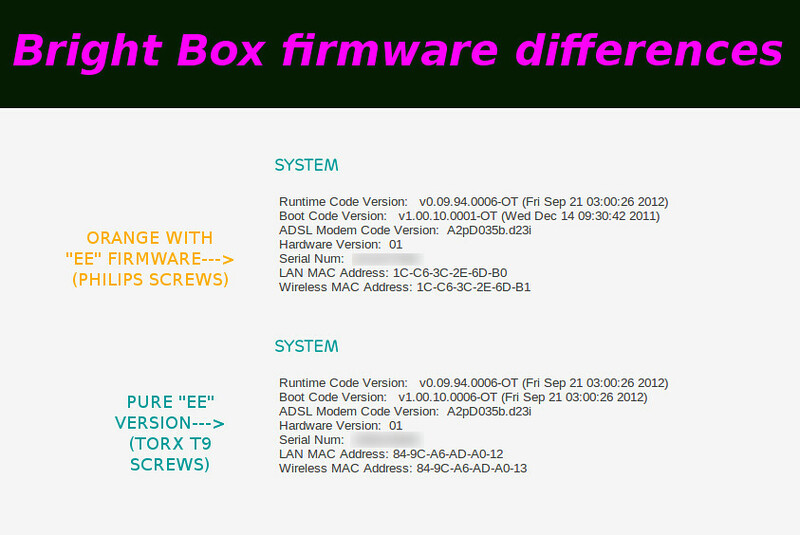 I rechecked these instructions on the EE firmware and they are the same. Good luck if you try this. Nice work bro, its a different way than I have done it, maybe you can use the script to set other TR69 Params, and with unlockia having run an alternative webserver on the box you could create a fully alternative web admkin interface with all of the params settable, it would be totally customisable, great work. set the IP address of manually. they are on the same subnet). to root prompt, continue with step 8. 12:Check that it has changed by doing step 9 again. try loging in with username: admin password assword because the manufacturer mode of the firmware will automatically default to these values, maybe the same for your situation / firmware, if not u can set them with a serial connection and interupting the boot process as unlockia has previously described. Last edited by unlokia; 22-April-2013 at 15:41. Not sure I want the Brightbox upgrading itself again. Wonder how to disable...? You could start by shutting out the ISP by turning off the TR69 stuff, There could possibly be other ways the BB looks for firmware updates, eg through a script run from it's webserver, but I would imagine it refers to the params listed above, I think the manufacturers and ISPs would want just one way to configure and deploy this stuff otherwise things would get complicated.